The British Chiropractic Association (BCA) is urging parents to think about their children’s posture as part of the preparation for the new school term. Whilst stationary and school books are important, it’s how your child carries them that can have the most impact on their health. 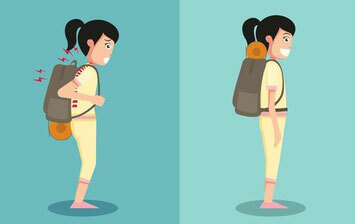 over a third (33%) of parents say that their child has suffered from back or neck pain in the past and, whilst back pain can be caused by a number of different factors, overloaded school bags are a common trigger. Nearly a third (31%) of children carry a one-strapped bag which can cause a number of problems due to the weight being loaded to just one shoulder. The BCA is calling for more parents to keep an eye on what their children carry around with them on a daily basis. “Making sure your child doesn’t suffer from back or neck pain this autumn term can be as simple as checking they aren’t carrying around heavy items with them unnecessarily and that they carry their school bag correctly." “I see an increasing number of young people complaining of back or neck pain and often it’s due to the weighty bags they carry. As youngsters have more belongings than ever before, like mobile phones and tablets, there’s a tendency for them to overfill their bags but, by doing these two basic things, you could be helping them avoid painful back problems”. • Keep it light – make sure your child is not carrying any unnecessary excess weight - check that all the items in their bags are essential for the day’s activity. • Check it out – make sure you know what your child is taking to school with them every day as they may be carrying heavy items with them unnecessarily. • Choose the right bag - a rucksack is the best option as long as it is carried over both shoulders and the straps are adjusted so that the bag is held close to the back and weight is evenly distributed. If your child has a one-strapped bag, make sure they carry it across the body and alternate which shoulder they carry it on. • Footwear is key - Make sure your child has good footwear; soft-soled shoes that are supportive and have a good grip will make it easier for the child to carry a school bag. For more specific advice please consult your chiropractor or physical therapist.